Georgia senior forward Yante Maten has a bloody lip after going up for a shot. The Georgia men’s basketball team dropped a 56-51 decision to the Kansas State Wildcats in the Big 12/SEC Challenge at the Bramlage Coliseum on Saturday afternoon in Manhattan, KS. It was the Bulldogs’ third loss in a row. Senior forward Yante Maten, redshirt senior guard Juwan Parker and junior forward Derek Ogbeide fueled the Georgia offense, each with a double-digit scoring performance of 14, 11 and 10, respectively. Maten has registered a double-digit point outing in all but one game this season. He also tacked on five rebounds and a block. With seven lead changes and six tied scores, the point-margin between the two teams never exceeded six points. Georgia won the rebound battle, totaling 38 boards to the Wildcats’ 27. 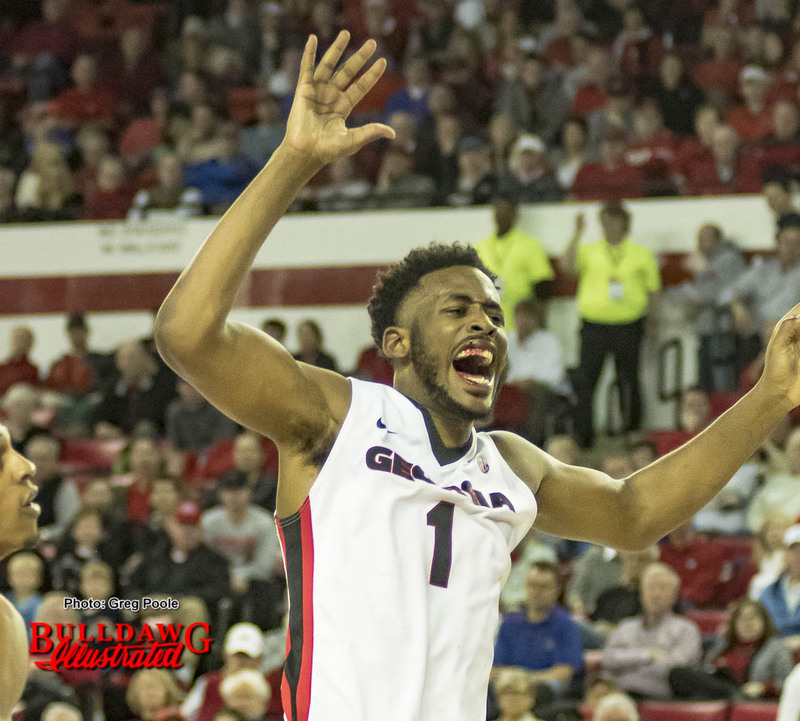 After Georgia (12-8, 3-5) jumped to a 4-0 lead in the opening minutes from Ogbeide and Parker jumpers, the two teams traded points until a Parker 3-pointer provided the Bulldogs the 15-11 edge. The Wildcats (16-5, 5-3) chipped away at the Georgia lead as the opening half winded down, taking a five-point advantage until Ogbeide supplied a dunk to cut the Kansas State margin to 26-23 at the half. Georgia answered in the second half with an 11-2 tear, including a 7-0 run in the first 2:30 of the frame for the 34-28 lead. The six-point edge, which marked the largest of the game, was orchestrated by six points from Maten and four from Parker. The Bulldogs contained the lead till the final five minutes of the game, when a Kansas State Cartier Diarra three-point play from a layup and a free throw knotted the game at 49. Another Wildcat free throw gave Kansas State its first lead since the first minute of the second half. Kansas State found success from the charity line, using 12 second-half free throws, and six in the final six minutes to overtake the Georgia lead and seal the 56-51 final. CLICK HERE for the full box score and results from Saturday’s Georgia-Kansas State men’s basketball game. Up next, Georgia returns home to Stegeman Coliseum to face Florida. The game will be available on SEC Network at 7:00 p.m.